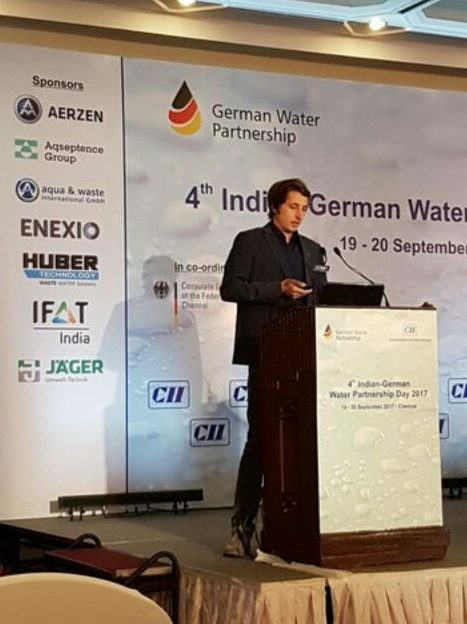 Project Engineer Henning Zeich attended at the 4th Indian-German Water Partnership-Day 2017 in Chennai, India. The overall topic of the conference was “German Solutions to Indian Challenges”. From the 19th to 20th of September 2017, numerous experts from Germany and India participated at the well-attended conference. After the inaugural Session, opened by Mr. M Ponnuswami, a roundtable on sustainable water and wastewater treatment – efficient management in water use, zero liquid discharge, energy and non revenue Water monitoring was conducted. On the second day, aqua & waste International GmbH took chance to give an inside view into the potential of simulation of wastewater treatment plants within the first session of the day (Smart Water Technologies – Intelligent Rural & Urban Management). The day was rounded off by several presentations about Reiable Onlinne Monitoring Activities in Fresh Water, Wastewater and Non revenue Water (Session 2) and Best practice technology for the Industrial Wastewater Treatment (Session 3). All in all the 4th GWP Day in Chennai was a huge success, providing a platform for the technical exchange between indian and german experts on all levels. We are looking forward to further activities on the indian market and future GWP days in India.